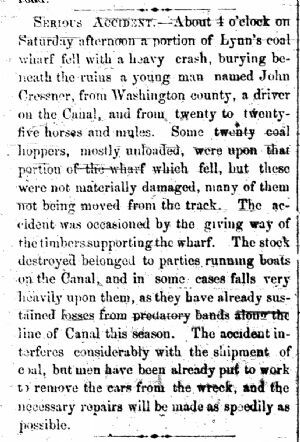 About 4 o'clock on Saturday afternoon a portion of Lynn's coal wharf fell with a heavy crash, burying beneath the ruins a young man named John Cressner, from Washington County, a driver on the Canal, and from twenty to twenty - five horses and mules. Some twenty coal hoppers, mostly unloaded, were upon that portion of the wharf which fell, but these were not materially damaged, many of them not being moved from the track. The accident was occasioned by the giving way of the timbers supporting the wharf. The stock destroyed belonged to parties running boats on the Canal, and in some cases falls very heavily upon them, as they have already sustained losses from predatory bands along the line of the Canal this season. The accident interferes considerably with the shipment of coal, but men have been already put to work to remove the cars from the wreck, and the necessary repairs will be made as speedily as possibly.